Race Tech is proud to announce they are now a WP Authorized Center. Due to the growing demand for genuine WP spare parts, WP and Race Tech have reached an agreement to make Race Tech a WP Authorized Center. In addition to offering genuine WP spare parts, Race Tech has also been qualified to properly service WP Suspension. “Race Tech is excited to provide consumers with an improved parts supply for genuine WP spare parts. We are also proud that WP has selected our staff of technicians to service WP Suspension,” said Race Tech’s President, Paul Thede. “WP suspension components are the most advanced in the motorcycle industry, so it’s important to have a strong, elite network of WP Authorized Centers. Partnering with Race Tech, a company known for great parts distribution, race support, and custom service, marks our commitment to excellence and positive growth in North America,” said WP North America Business Development Manager Kyle Guglielmetti. Race Tech has a long history of tuning of WP suspension components through support of many elite KTM Orange Brigade riders. 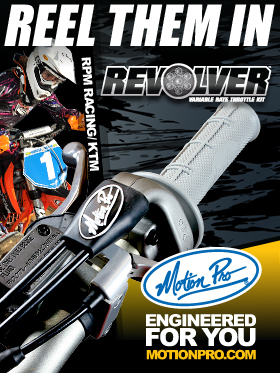 The new relationship with WP as an Authorized Center, will allow Race Tech to provide even better support to riders everywhere utilizing WP Suspension. For more information about Race Tech’s products, seminars and rider support program, please visit racetech.com or call their friendly sales staff at: (951)279-6655. To apply for Race Tech Rider Support, click here. Check out their website at: www.racetech.com.